April, 2000 -- Text-to-speech software helps hearing and visually impaired understand train bulletins. April, 2000 -- Jon Bentley receives Excellence in Programming Award. September, 1999 --elemedia(TM) software venture introduces programmable servers to create multimedia services for Internet protocol telephony. May, 1999 -- Lucent co-founds International Softswitch(sm) Consortium to promote open standards and protocols, and new application development for distributed hardware and software platforms that can interconnect traditional telephone networks with Internet information and applications. May, 1999 -- Persystant Technologies new venture uses Bell Labs software to support large-group Internet-based collaboration. May, 1999 -- Real World VoIP Networks® support voice over the Internet. April, 1999 -- (TM) Business Exchange Service supports end-to-end packet voice and data for IP or ATM networks. March, 1999 -- Lucent co-founds Voice eXtension Markup Language Forum to promote VXML standard. March, 1999 -- Ken Thompson receives IEEE Computer Society's first Tsutomu Kanai Award for contributions to distributed computing systems. January, 1999 -- Bell Labs develops voice over the Internet PacketStar® products supporting Internet voice and fax calls. December, 1998 -- Ken Thompson and Dennis Ritchie receive U.S. National Medal of Technology. October, 1998 -- Lucent IP Exchange Systems aid in convergence of voice and data nets. August, 1998 -- Lucent Speech Application Platform supports Windows*-based speech-enabled applications. March, 1998 -- (TM) Bandwidth Manager routes voice, ATM, IP and video traffic. December, 1997 -- Lucent Managed Firewall protects data networks. December, 1997 -- Visual Insights(TM) software uncovers and displays trends and patterns often buried in large amounts of data in an interactive, graphical format, allowing users to quickly analyze complex and expanding networked databases. May, 1997 -- Veridicom® venture offers Bell Labs patented fingerprint-authentication technology in advanced software and hardware components for identification verification. March, 1997 -- Inferno(TM) real-time network operating system Release 1.0 provides end-to-end connectivity over the public telephone network, the Internet, corporate networks, cable television, and satellite broadcasting. 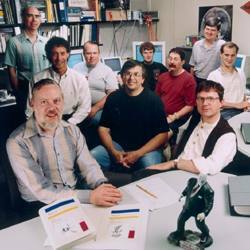 July, 1995 -- The Plan 9 computer operating system, designed to work in the distributed, networked computing world, is developed by a team led by Dennis Ritchie. October, 1996 -- New K56flex 56kb/s modem speeds Internet access, anticipates V.90 protocol. September, 1996 -- elemedia® software offers platform-independent software components that enable multimedia communications over packet networks for both business and consumer markets. September, 1996 -- Reliable Multicast Software permits the reliable transmission of real-time data, such as software distribution, financial news, and e-mail, over the Internet. May, 1996 -- Inferno(TM) software supports networking software. April, 1996 -- Lucent Technologies is created, with Bell Labs as it research and development arm. * Product names are the registered marks of their respective companies.